Investors in a luxury property development in India are being offered the chance to have “conversation and dinner” with Donald Trump Jr. The eldest son of the US president is visiting India this week and will promote the Trump Towers development near Delhi. But Mr Trump Jr has said he has been building relationships in India for years. The 47-storey towers in Gurgaon, close to the Indian capital, are being developed by the Trump Organisation and local partners. The Trump Organisation, formerly headed up by President Donald Trump, is an umbrella company for hundreds of investments in businesses including real estate. Donald Jr is now its executive director. India is the group’s biggest property market outside the US, and in 2016 the Trump family earned up to $3m (£2.14m) in royalties from ventures in India, according to a financial disclosure report. Daniel S Markey, who worked on South Asia policy for the State Department during the George W Bush administration, said he was surprised by the involvement of Mr Trump Jr in an Indian business deal. “The idea that the president’s son would be going and shilling the president’s brand at same time Donald Trump is president and is managing strategic and foreign relations with India – that is just bizarre,” he told the New York Times. 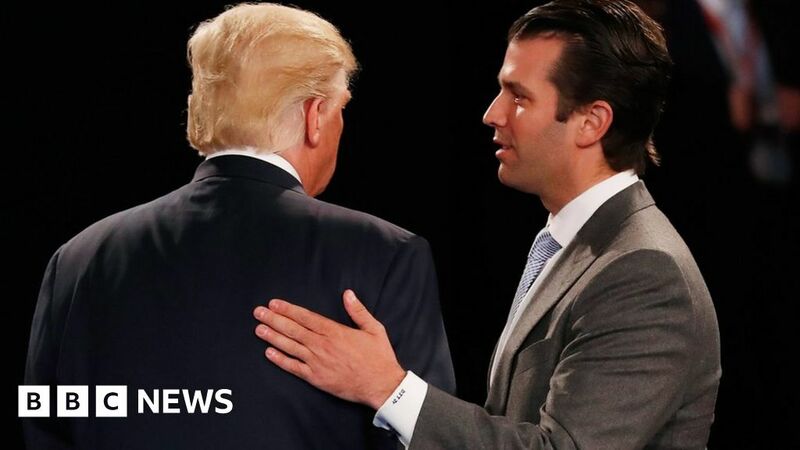 In an interview last week, cited by The Guardian, Donald Trump Jr said he had spent nearly a decade “cultivating relationships in India” and that the firm was “now seeing the response of that effort”. He said his itinerary was designed to steer clear of politics. However, he is listed as a keynote speaker at a global business conference, which will be attended by Indian politicians including Prime Minister Narendra Modi and some of India’s business elite. Media captionIn 2014, Donald Trump told the BBC why he was so keen on investment in India as he launched a Trump Tower in Mumbai. President Trump handed over control of his business empire to Donald Trump Junior and Eric Trump before his inauguration last year. But the director of the US Office of Government Ethics said at the time that this did not go far enough to ensure there would be no conflict of interest between his politics and personal business. Since taking office, critics have claimed the US president is continuing to profit from his family’s business interests. In May last year, the company owned by the family of Jared Kushner, Donald Trump’s son-in-law, pulled out of real estate presentation in China. Kushner Companies had been scheduled to pitch opportunities to real estate investors in China, but Mr Kushner’s sister was widely criticised for using his name in a pitch. And in November last year, President Trump’s daughter, Ivanka, was criticised for speaking at a global entrepreneurs summit in Hyderabad, with some saying the summit had become more about Ms Trump and her namesake brand that the wider issue.